Back on April 25th, the Rescue team received a report of a seal in Duxbury, MA close to dark. We don't normally respond in the dark, but it was still light enough that a field volunteer was able to take a look and make sure people were not still approaching the animal. 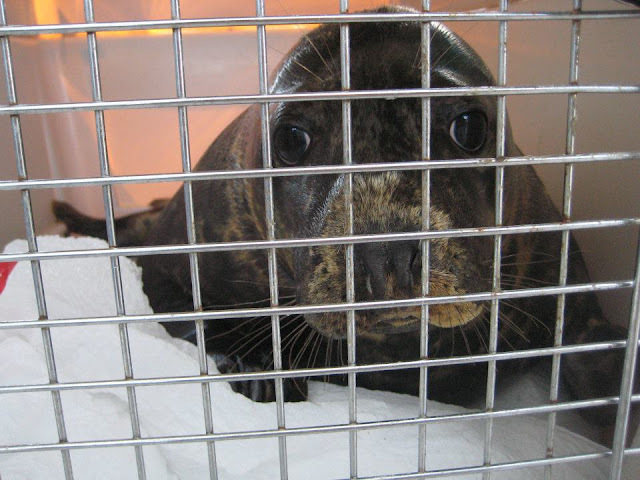 The animal ended up being a grey seal, and here is her story. The morning after the initial report, we heard that the seal was still on the beach. Seals are semi-aquatic so it is not unusual for them to be resting on the beach and they can be out of the water for several days at a time. Since the seal was getting quite a bit of attention the night before, I decided to take a ride down there with a volunteer to take a look and do some education. The beach was luckily pretty quiet when we arrived and the seal was in a well hidden spot. I bet you can't even see her in this photo. We did a close approach (normally it is best to stay at least 150 feet away from a seal) to assess, and the animal was very thin and lethargic. The above picture shows a good posture for the animal, but I ended up closer than I would hope for a grey seal to respond like that and the behavior wasn't quite what I would expect. After some debate, I checked with UNE MARC and they were willing to take her for rehabilitation so I decided she was a good candidate and drove her up to Biddeford, Maine. 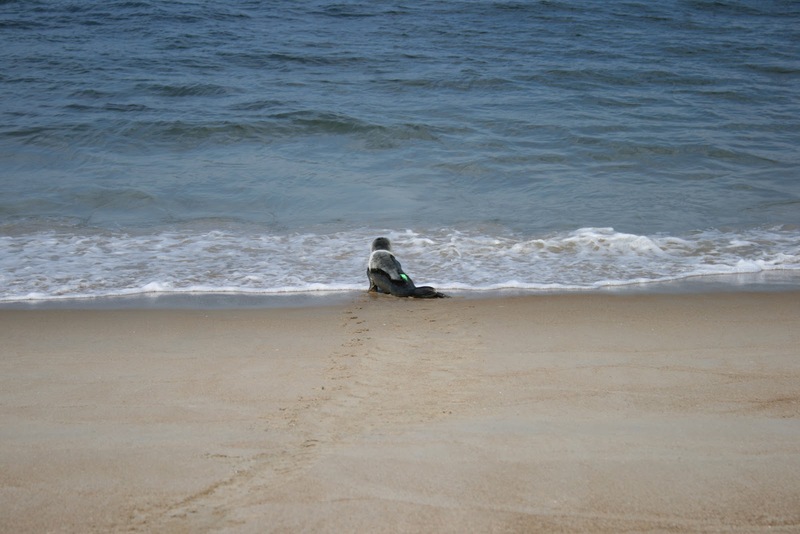 After 3 months of rehabilitation at UNE, the grey seal, named 'Trenette' by UNE staff, was ready for release. 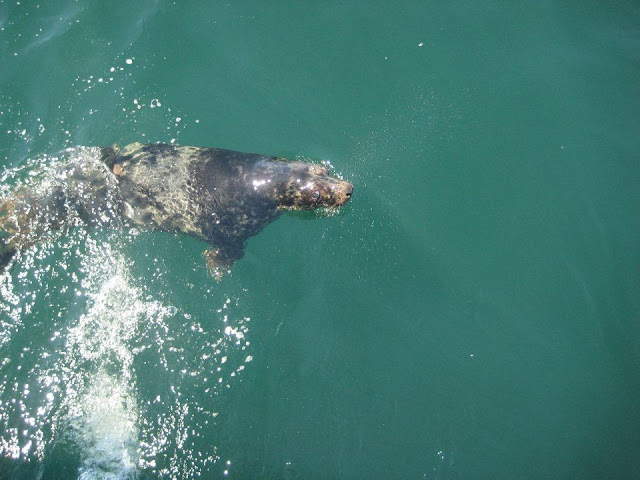 I was very excited to be invited to the special day, which included seal releases aboard a whale watch boat. 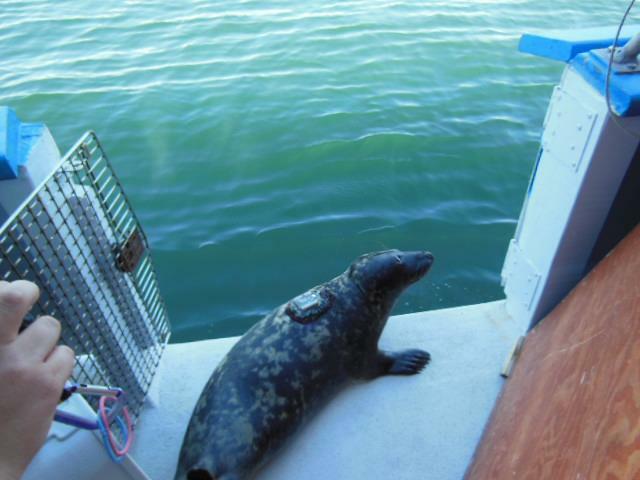 Normally, seals are released from the beach, but UNE decided to try something different and release these animals into the open water away from crowded beaches. And look at her now! At 71 pounds (over doubled in size! ), 'Trenette' was ready for release. She was outfitted with a satellite tag so that UNE can track her journey after release. You may remember some past turtles from NEAQ receiving satellite tags. The application is similar where an epoxy (basically a heavy duty glue) is used to attach the tag to the fur. It is not a permanent fixture and will come off eventually. You can track 'Trenette' on WhaleNet (her track is not posted yet so make sure to check back). Taylor, the NEAQ volunteer who assisted in 'Trenette's' rescue back in April, and I were given the honor of allowing 'Trenette' to leave her kennel. 'Trenette' gave us one last look. 'Trenette' pops her head out of the water to give us one last goodbye. We wish her the best! A second grey seal was also released that day. 'Alfredo' (notice the pasta themed names) stranded in Biddeford, ME, right down the street from UNE on March 23, 2012. That seems like a convenient rescue! At 141 pounds, 'Alfredo' belly flops into the ocean. Note the pink tag on her right rear flipper. 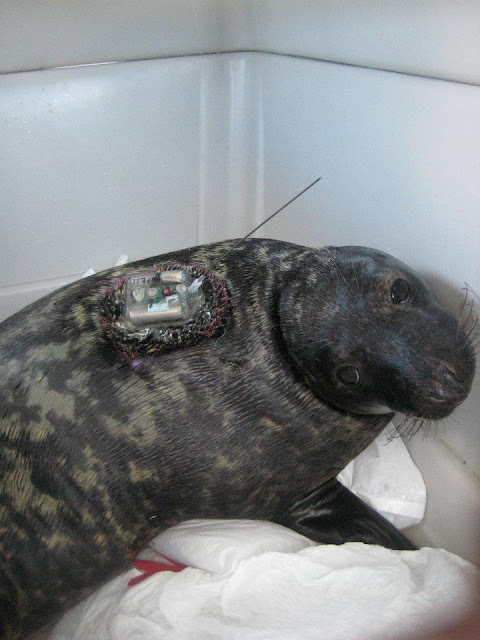 All seals that are released receive a tag with a particular number and UNE contact information on it in case they are sighted again. 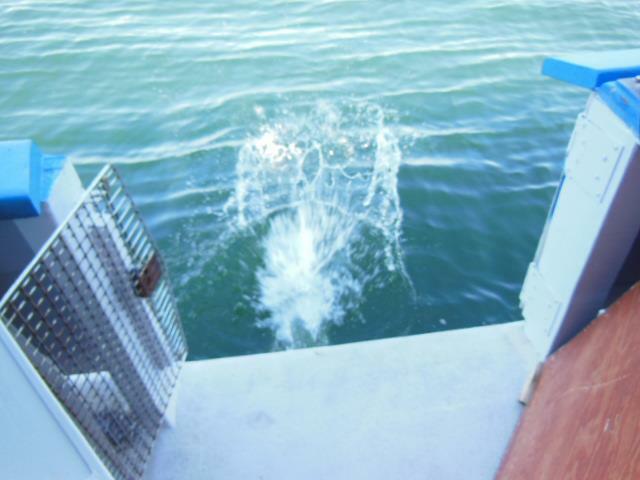 Above, 'Alfredo' makes some laps around the boat. Perhaps she was sad to go after the amazing care provided by UNE staff and volunteers. After the seals were released, we all enjoyed the whale watch. 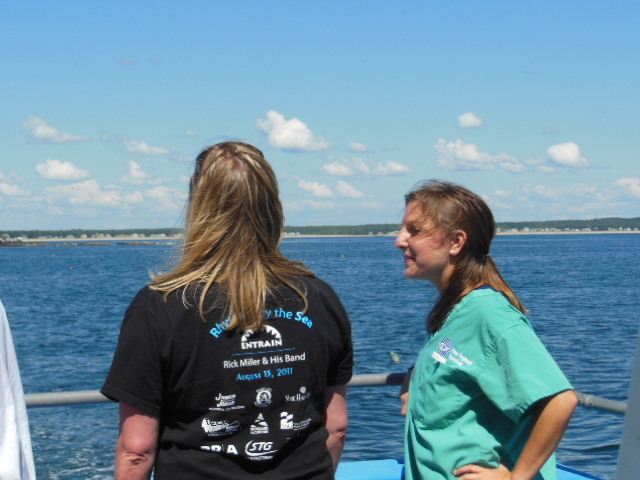 Above, Asheley (a staff member from UNE) and NEAQ volunteer Taylor scout the open water. 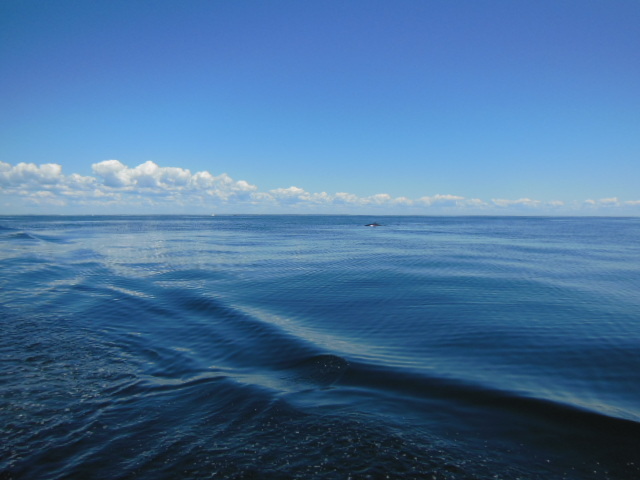 A minke whale out in the distance (you can read about the minke whale necropsy from back in March in this post). We saw two minke whales, one fin whale, multiple harbor porpoises, and some other seals on a fantastic whale watch from Indian Whale Watch in Saco, ME. It was nice to see some healthy animals! 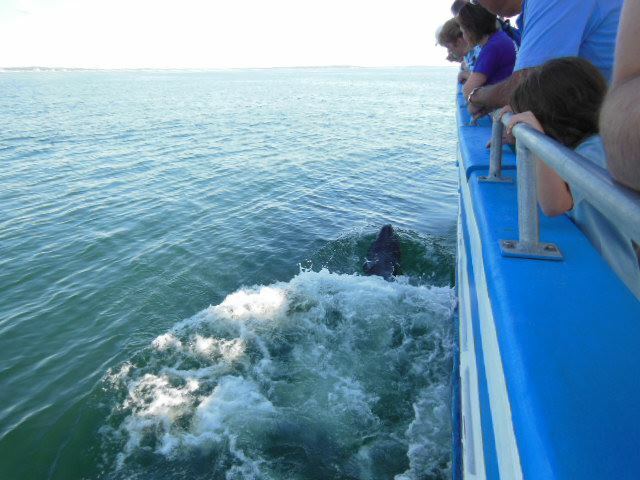 UNE did another release of three harbor seals from the whale watch boat the next day. There is a great story about one of the animals, Wiggle, which you can see in this news video. Also, on a side note, if you ever go to Maine, save the date for UNE's Frolic for Flippers on September 22nd. This 5K is a great fundraising event hosted by UNE MARC. It was a fantastic day overall. A special thanks to the UNE crew for rehabilitating this seal and inviting us along for the release, as well as to Indian Whale Watch for a fantastic adventure. Thank you for joining us on the Marine Animal Rescue Team Blog and on the Aquarium's Google+ page to get a live look at the rescue team's work. Here's the recorded hangout. Looking for more? 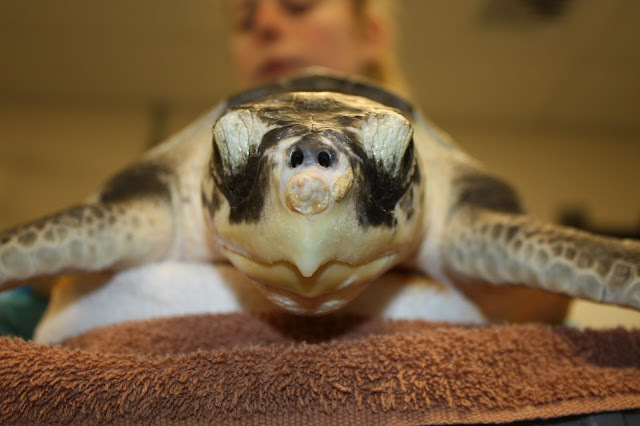 Check out this previously webcast and this research page for general information about the Aquarium's sea turtle rescue program. You can also read previous posts from this season for more details about the current group of rescued sea turtles. Stay tuned to this blog for some follow up posts from the Hangout on Air, and leave comments with us if you'd like to be part of the next Hangout! Every summer, harbor seal pups come on shore and we must learn to share the beach with them. Unfortunately for these young animals, as they learn life on their own (it only takes 4 weeks for them to be weaned and completely independent from their mother! ), they tend to pick some crowded or awkward beaches to rest on. 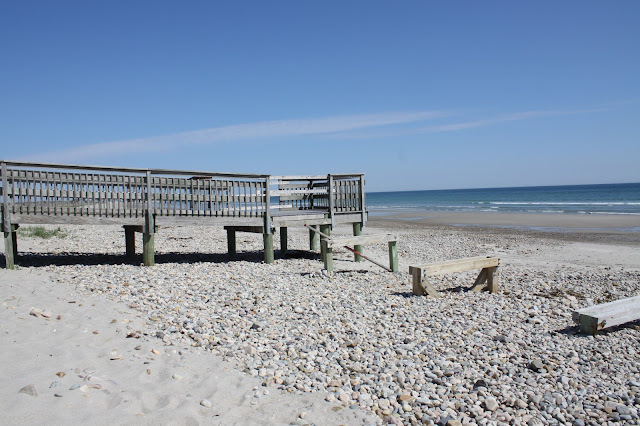 The best thing you can do for them is keep your distance and call our stranding hotline - 617-973-5247. The majority of the time, seals are just resting on the beach. This harbor seal pup picked some good rocks to rest on. They come out to rest, so don't be surprised if they look tired. 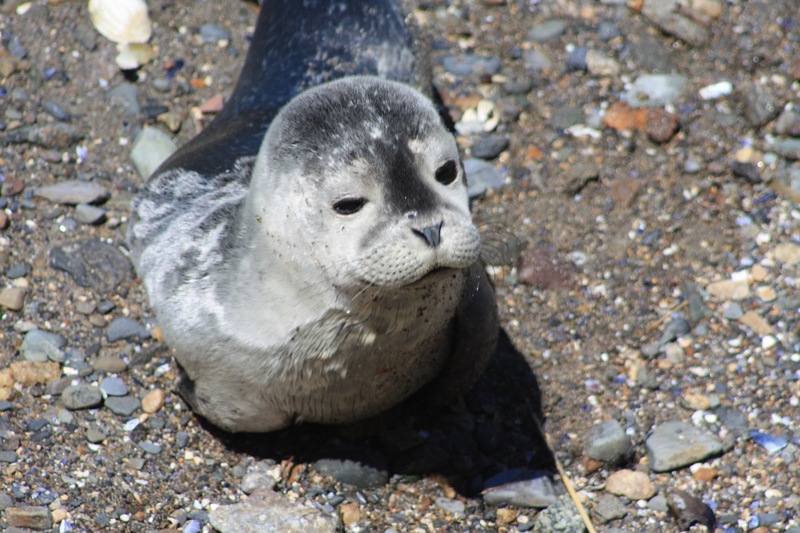 The above harbor seal pup is in very good condition. He is laying on his side and has a good body weight. Unfortunately you can notice someone incredibly close to the animal. Although seals tend not to retreat from humans, our presence, including the sound of our voices, is not comforting. 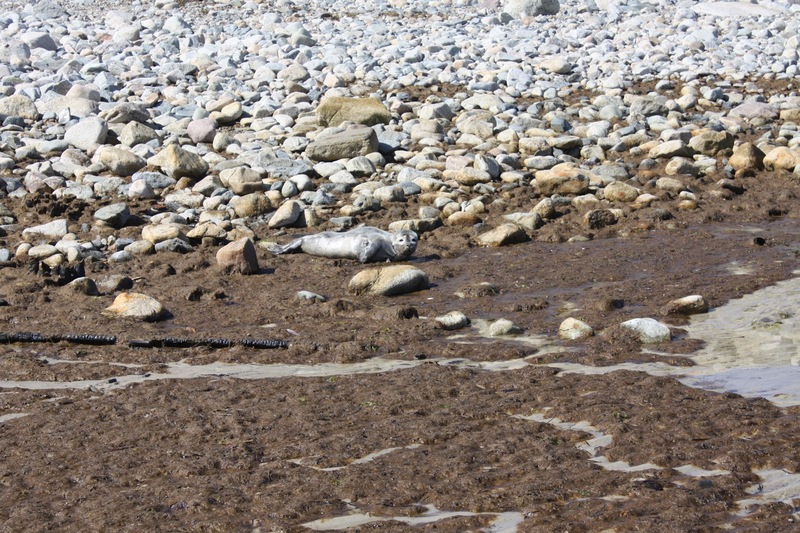 Above, you can see how stressful it is for a harbor seal pup to rest on this beach. These people are too close! Sometimes you can not always tell externally the extreme physiological stress the animal is experiencing. Since this seal is a pup and still naive, he hasn't figured out the effect this will have on him. It is recommended to stay at least 150 feet away from seals on the beach to limit the stress. Sometimes seals, like the one above, sustain wounds. Not all are life threatening though so when you call our hotline, remaining calm and using the best description of the wound is extremely helpful. We may ask for photos to assess, but you should remember not to get too close. Seals are protected by the Marine Mammal Protection Act so it is illegal to harass them in any way (anything that will alter their natural behavior). The above photo shows a seal that was closely approached by the photographer, so he is unable to rest as he would normally do on the beach. There are some signs of stress that you can look for. 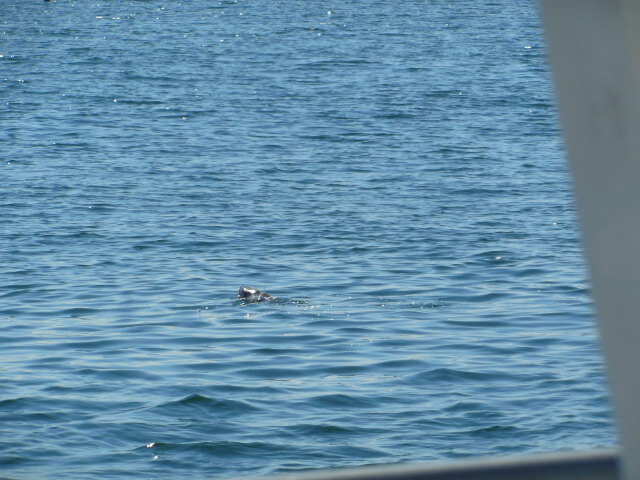 For example, the above gray seal is not waving at the photographer. The flipper movement is a sign of stress and is your cue to back away. Other signs of stress include shivering, vocalizing, yawning, and labored breathing. Seals should never be covered or have water poured on them. It is natural for them to be on the beach, and they are able to thermoregulate so you do not want to interfere with that process. Also, do not offer the animal any food. Seals are opportunistic feeders and do not eat every day or on land. Human food is also not appropriate for them. Keep in mind sometimes these young pups rest in awkward places, as you can see in the above photo where the seal is resting on the stairs. 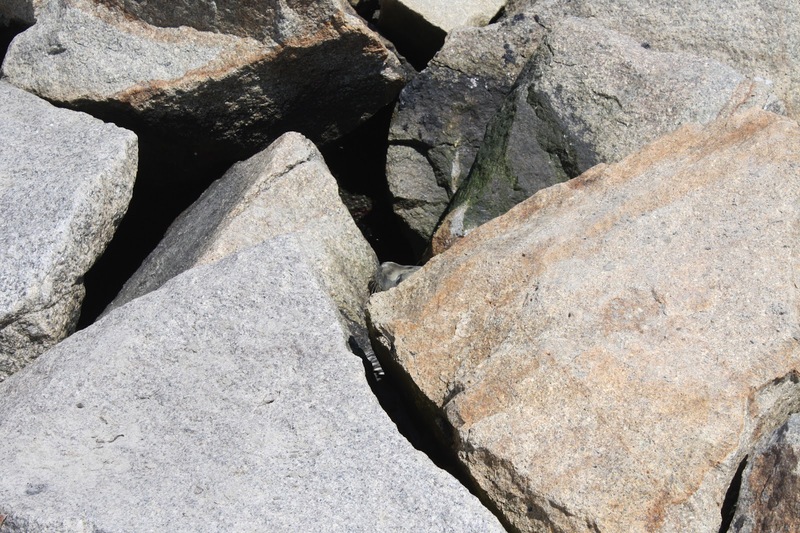 Some people get concerned about seals being on such rocky beaches as well, but it is natural for them to rest on rocks and we are not alarmed when we see some superficial abrasions from the rough environment. Sometimes seals do get in situations we can help with. Can you find the seal in the top left photo? This seal was on a jetty, but as people approached, it went further and further into the rocks. 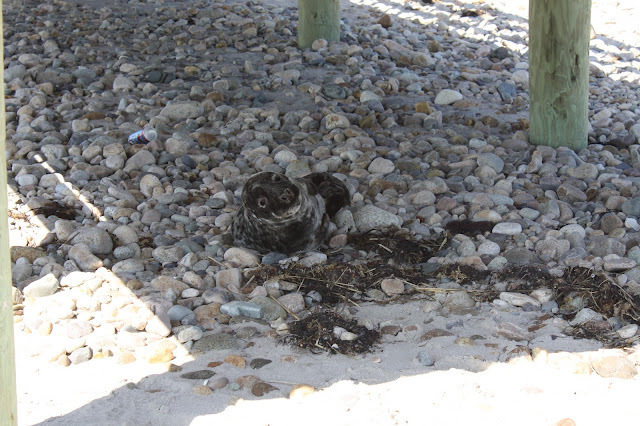 He likely could have gotten out on his own if the area was quiet, but we were able to help him a bit and move him to a quiet beach where he went back in the water (Photo below). 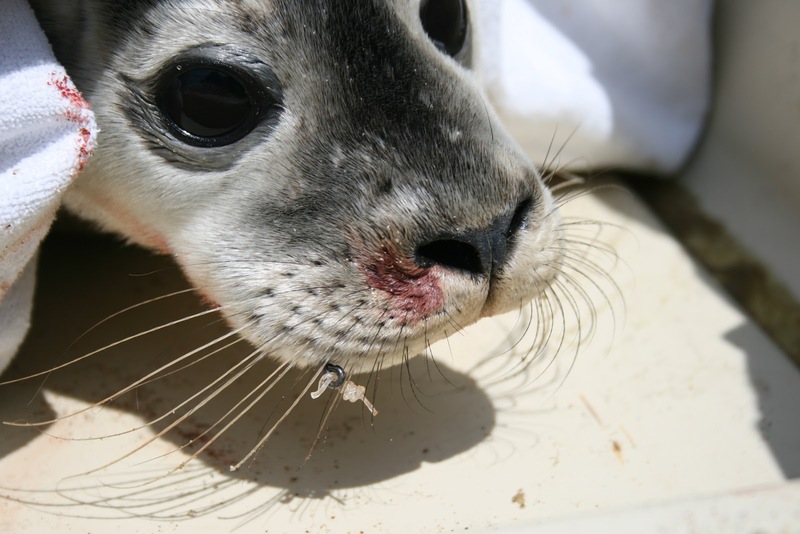 Another case we dealt with last week involved a seal with a fish hook in it's mouth. The pictures below tell the tale. 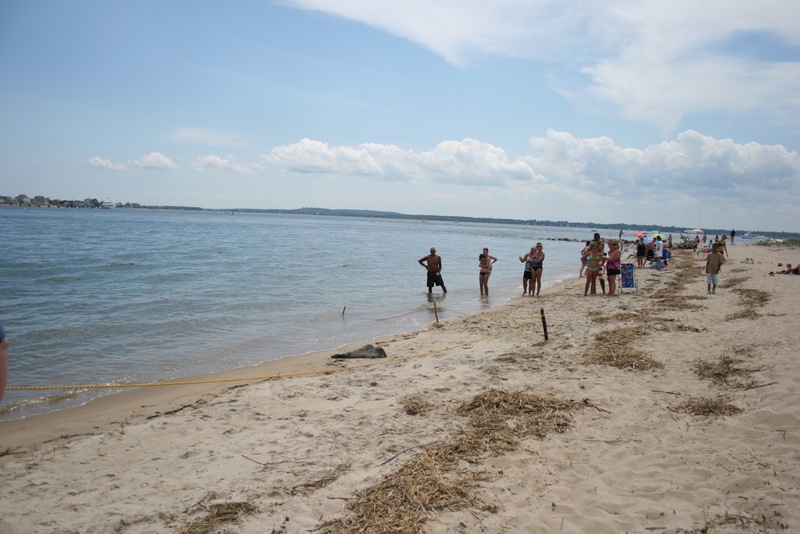 The seal came out on a very crowded beach, but luckily some beach goers were able to rope the area off for us. 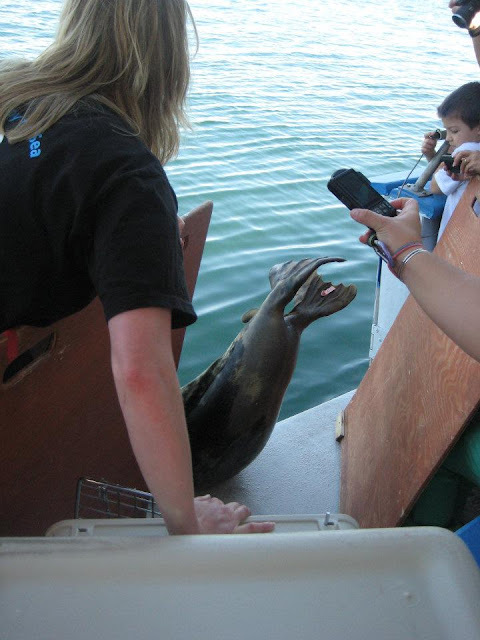 This gave us time to respond with out the seal being scared back into the water. 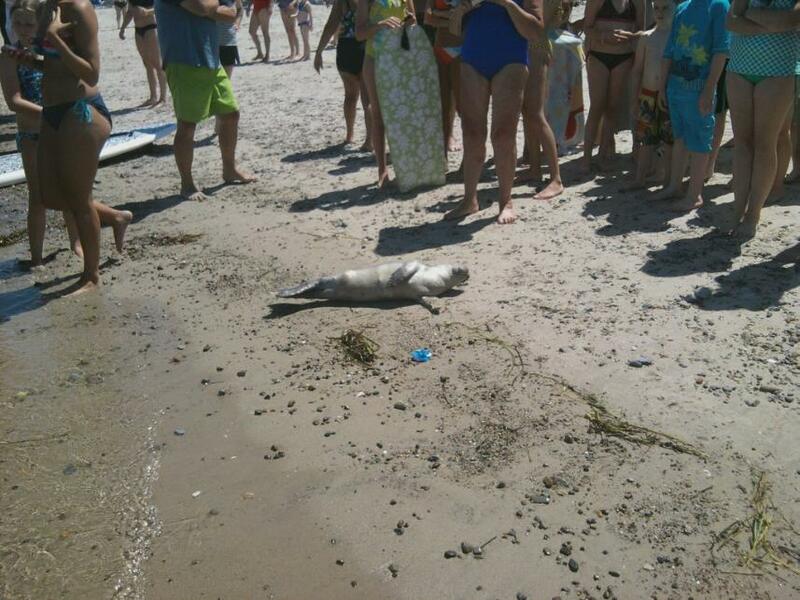 Helpful beach-goers roped off the area around the injured seal. You can see the fish hook in the seal's mouth. We were able to remove the fish hook fairly easily. 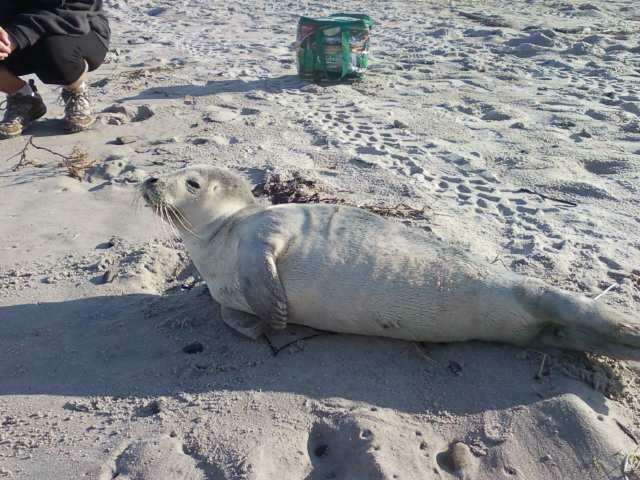 We cleaned up the wound, which wasn't as severe as you would expect, and relocated the seal to a quiet beach where it could get the rest it needed to heal. Or in this case it went back in the water (photo above). This article from the Newburyport Daily News explains how everyone, including state police and the public, came together that day to make a bad situation have a good outcome. 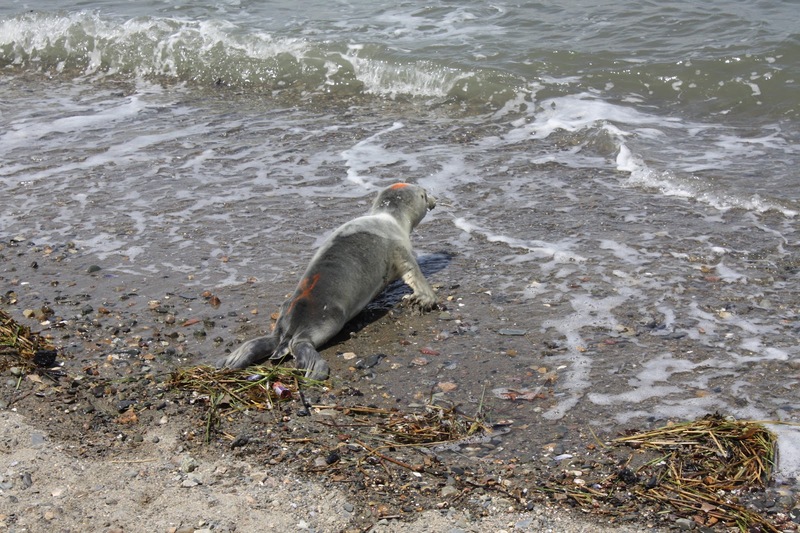 Relocating a seal is a last resort as this process is also very stressful for an animal. 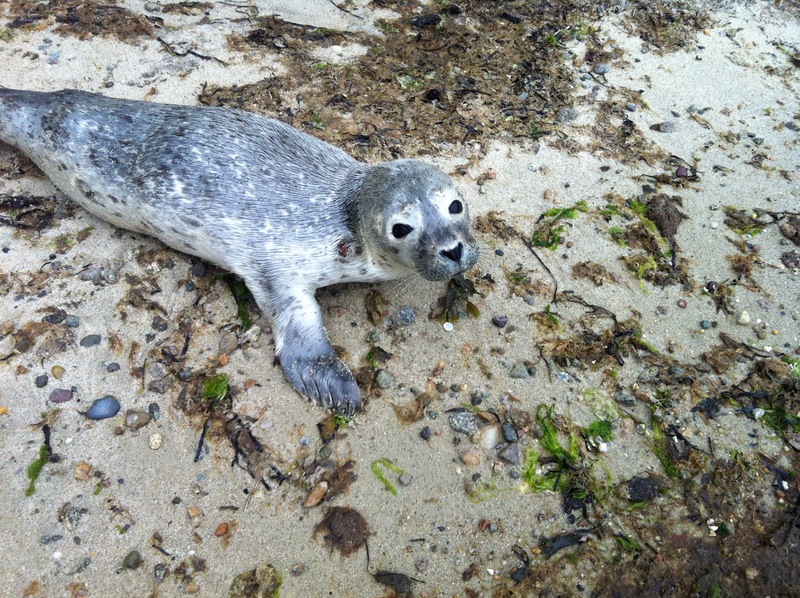 So remember, always keep your distance and share the shore with the seal pups on the beach! As you can see, seals are keeping us pretty busy these days. 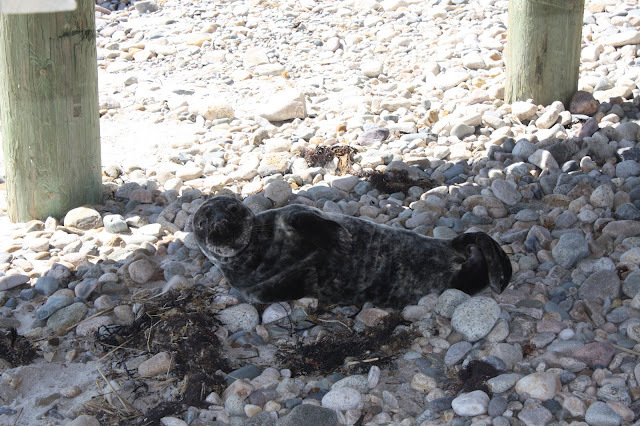 You can read past posts here on what to do when you see a seal on the beach. But we also have some turtles still in our care. 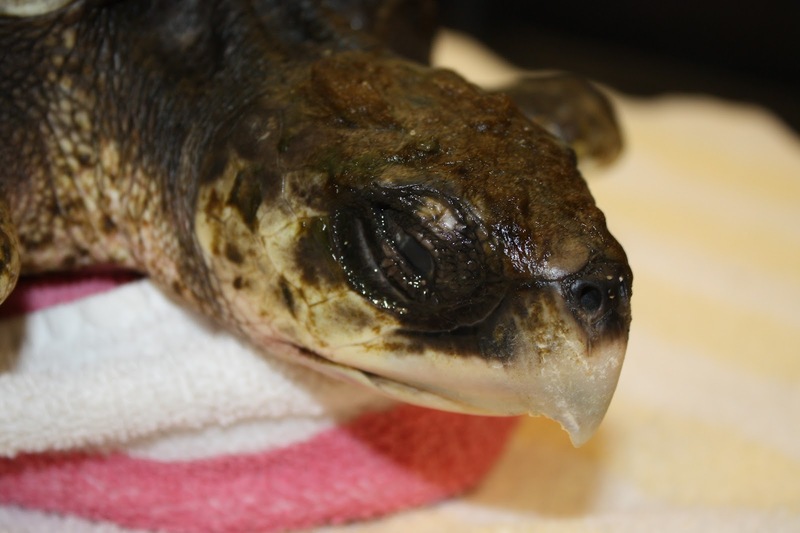 Don't forget about the Live Webcast On Wednesday July 18th at noon to see our sea turtle patients and get an update on the rescue department activities. I hope to see you there! What a difference a couple of weeks make in Rescue. It has been a few weeks since the last release and things around the clinic in Quincy have slowed down tremendously. 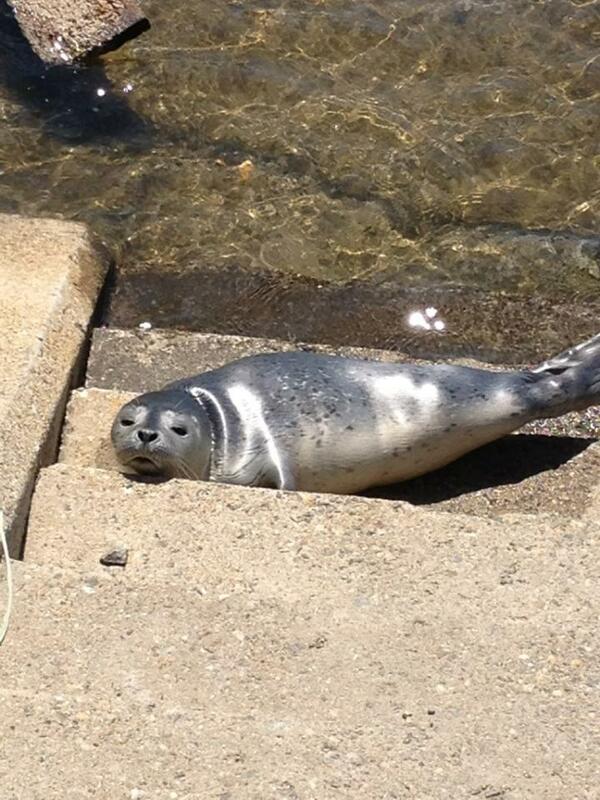 Healthy weaned harbor seal pup hanging out in Hull about a week ago! But that's a post for another time. We have eight turtles still in rehab. 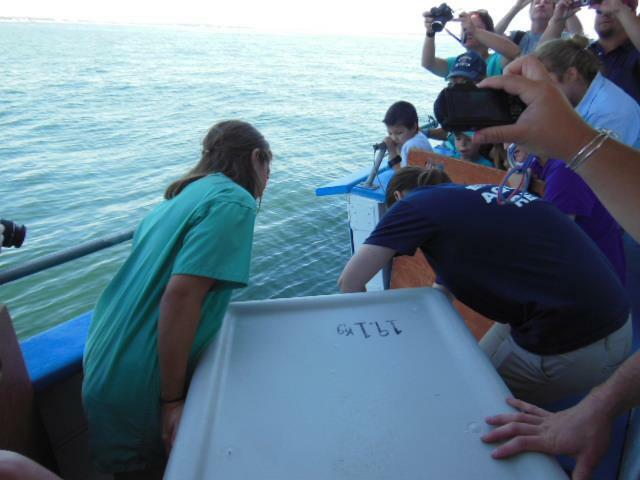 These turtles had not been cleared medically for release when the last transport left. But in the past few weeks some more turtles have been cleared for the next release. 13 Gambit: Cleared for release! Dazzler's intake photo. Wait til you see the turtle now. 16 Dazzler: Cleared for release! 17 Cyclops: Cleared for release! Venom is looking at the camera. Cyclops is positioned away. I believe that's Zan trying to hide under the barrel! 37 Venom: Cleared for release! Robin peering out from the "kelp/turtle grass bed" enrichment. 38 Robin: Cleared for release! Thor coming up for a quick breath! 46 Thor: One more blood analysis and set of radiographs. Release pending. Daredevil relaxing at the bottom of the pool. 61 Daredevil: Cleared for release! 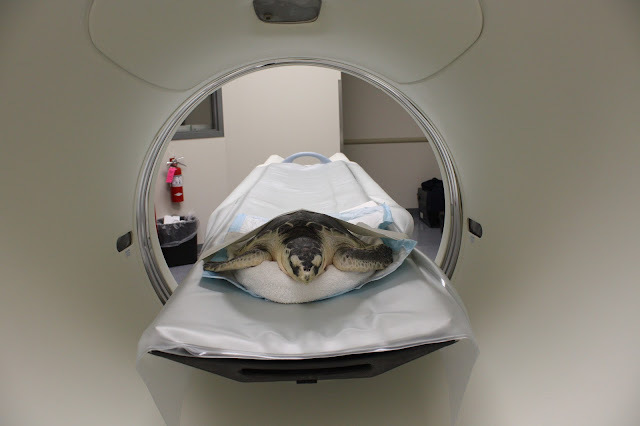 Zan undergoing a CT scan at Mass Vet Referral Hospital in Woburn MA. 33 Zan: Still undergoing some clinical evaluations. Release Pending. We hope to get all of the turtles out once the waters in our area warm up enough. As long as everything goes well the rescue tanks should be empty by mid-August!